The Monarch 9805 has been discontinued. No direct replacement is available. The 9805 printer combines high-quality performance and reliability with overall low total cost of ownership. 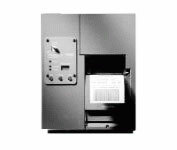 The 9805 compliance printer is the economical solution to meeting labeling requirements. Straightforward design, rugged construction and easy operation make it ideal for industrial environments. 6 inch per second print speed, 203 dot per inch print quality, industrial grade metal cabinet, 600-meter supply ribbon. Thermal transfer, 4" print width, 203 dpi resolution, 6 ips, serial interface. 1.2" wide x 1.1" tall white Direct thermal labels for the PathFinder Printer. 515 labels/roll, 50 roll case. 4" x 6" Thermal transfer Paper Label, Fanfolded, 1,900 labels/stack, 2 stacks/case. Includes 1 roll of 4.33" x 1,968' Wax Ribbon. Priced per kit. Wax Ribbon (4 inch x 1968 feet) for the 98XX Printers. Single roll. Replacement Printhead Kit, 203 dpi. Compatible to part number 12055101.